I Am Charlie. Unless you live in a cave, you probably have heard something about a terrorist attack on a weekly magazine in Paris this week. Charlie is Charlie Hebdo. Who’s he? Well, that’s French for Weekly Charlie — and they chose “Charlie” for Charlie Brown, the perpetual underdog in the Peanuts comic strip. Muslim extremists retaliated at the time by firebombing the magazine’s offices. Mohammed Moussaoui, head of the French Council of the Muslim Faith, said the organisation deplores “the very mocking tone of the paper toward Islam and its prophet but reaffirms with force its total opposition to all acts and all forms of violence.” Despite the violence at the time, the magazine didn’t back down: it continued to publish mocking cartoons of the Islamic prophet. Extremist terrorists attacked the magazine again on Wednesday (7 January), when three gunmen broke into the magazine’s office during business hours and started shooting. Twelve people were killed, including the editor, five staff cartoonists, several other staffers, economic journalist Bernard Maris (a shareholder in the magazine), and two police officers; one of the officers was …Muslim. Eleven more people were wounded. French citizens were outraged, and even though the gunmen were still at large, they took to the streets chanting and holding up signs with the slogan Je Suis Charlie — “I Am Charlie” — to demonstrate their support for freedom of expression, and their condemnation of the outrageous attacks. Today, two men, brothers who are believed to be behind the attacks on Wednesday, were killed in a shootout at a warehouse near Paris, where they were holding a hostage. Separately, anti-terrorist forces stormed a grocery store in Paris where hostages were being held by a gunman who is reportedly linked to the brothers; the gunman was killed, but so were several hostages. It will take some time to sort things out to see if the three gunmen are the same three who attacked the magazine, but that seems likely. Of course, others may also be involved. And I Am Charlie too, not just because I’m a thinking person, but also because I make my living saying what I think needs to be said, even when I know some will be offended by it. Indeed, as I’ve said before, there’s no need for laws ensuring “Freedom of Speech” for speech that everyone agrees with. You would think that The Media, especially American newspapers, would understand all of this and line up behind Charlie Hebdo’s brave struggle for journalistic freedom. You would be wrong. McPaper USA Today actually went so far as publish an “Opposing View” the day after this week’s attack from a radical Muslim cleric in London who said that “In an increasingly unstable and insecure world, the potential consequences of insulting the Messenger Muhammad are known to Muslims and non-Muslims alike.” Hey: you all know that we don’t like it, so since we don’t believe in freedom of expression, how can you possibly be surprised when we come and kill you when you have the gall to practice it! USA Today is Not Charlie. By the way, I’m not the one who identified the op-ed contributor as a radical Muslim cleric; USA Today did, right below the piece, which I’m choosing not to link to. The paper did attempt to explain why they ran it, noting the cleric (who also defended the 9/11 attacks) “has both influence and insight” to present such an “opposing view” — as if it has some sort of legitimacy, or that all opposing views deserve equal time. Yes, I agree that it’s instructive for non-Muslims to understand the point of view, but there are knowledgeable people who can present it without adding legitimacy to those who openly support and encourage murder. That’s not any sort of divine revelation, that’s the ravings of a lunatic. Yet his many followers blindly believed him, even though his prior predictions had proved to be false. And yep, I made unmerciful fun of him and his predictions. Should Harold Camping’s followers have come to my office and killed me, because he was so infallibly right? And should USA Today have brought in a maniac to support Camping’s false prophecy? So how do we decide what’s right? The only legitimate way is to not just allow, but encourage open public discourse: to embrace freedom of expression not because everyone is right, or has a valid point of view, but because that’s the only way to get to the bottom of anything. To truly thrive, ideas must see the light of day, be subject to investigation, exploration, and testing to see if they hold up. If not, we can all move on. If so, then great! The world got a little smarter, and we can build on that and explore the next idea. Yes, Islamic ideas too: they can be presented by rational people who shout down the maniacs so that we understand why they reject (say) freedom of expression, which leads to understanding — and gives a way to start countering the idea, should we wish to try. Instead, the terrorists sent a different message to the world: that they believe their religion is too weak to stand up to the light of day, to be debated, to be explored, to be thought about. Instead, “We will kill you if you don’t unquestionably believe what we say the prophet teaches!” is the only option they offered, and there are many others like them. The world must clearly reject that thinking. As I do. I Am Charlie: I embrace the airing of ideas freely, even if I don’t personally agree with them. Let’s discuss them rationally, and see what works. And soundly, even forcefully, reject the rest. Of course couldn’t agree more. If I may add however the popular #IamCharlie can only further the case for freedom of expression if the person who uses it proceeds to reaffirm that freedom in potentially risky ways. I know this might not apply to Americans in a straightforward way but in Europe we have to be careful about anything we say. Recently an investigation was announced because someone used the word jock on twitter to refer to Scottish people. And that’s in freedom loving Britain. I won’t even start describing the situation in Italy. We need to show one can’t grandstand on Mohammad’s depiction and then proceed to disallow insulting the Queen for example or a Head of State. You either have something like the 1st Amendment or you don’t. Republishing Charlie Hebdo cartoons doesn’t cut it when too many have done the same. I’d rather each one of us made the point in our own unique, offensive to somebody way. Good article and something I expected you to write. However there are two mistakes. 1. They did not choose name from Peanuts character, at least not directly. After some controversy and troubles with the law in 1970 after mocking death of Charles de Gaulle they renamed it Charlie Hebdo. Charlie came from Charlie Mensuel (French for Charlie Monthly) Hebdo is, as you’ve noted, short for Hebdomadaire, weekly. They did it because previous incarnation was banned and they renamed it to get around said ban. Charlie Mensuel was named after Peanuts character but to say Charlie Hebdo is named after him is stretching it. 2. Two policemen that died weren’t there to protect the building. One was bodyguard of editor after he received death threats years back, other one (shot outside) seems to be unconnected to newspaper and was likely just responding to attack. He was of Algerian descent, as was one of other victims, BTW. Instead of “I am Charlie”, I prefer “I am Ahmed“….the muslim police officer killed. This may just be me being cynical, but the thought occurred to me that the reason USAToday used that particular guest columnist was to show its regular readers how awful Muslims really are, because here’s one, and clearly he speaks for all of them, and listen to the terrible things he’s saying! (In other words, they’re stirring up anti-Muslim sentiment to sell more papers, get more clickthroughs, and make more money, in addition to giving vent to their fear-filled racist ideas. Yeah, I don’t have a lot of respect for that paper. I guess it shows, huh? I regard the people who committed the attack on Charlie Hebdo, as well as the guest columnist USA Today used and Bill Donahue (head of the Catholic League) and his comments regarding the attacks –where he said, among other things, that he sympathized with the perpetrators — to be two sides of the same coin: little more than cowards who use religion as an excuse to pardon even the most disgusting things. As we have seen in the past, religion can be a force for good. Sadly, more and more, it is being used for much worse — and has been for centuries. Nailed it! I’ve been a lurker for a while, but I couldn’t agree more — in fact I upgraded to Premium to show my support. A question comes to mind about this whole situation, and you seemed to have pointed the spotlight on it — do they really feel that Islam, a faith practiced by more than a billion people worldwide, is REALLY so weak that a cartoon is going to bring it down? Zealots of any religious, cultural or political stripe are just NOT getting it. Charlie Hebdo — whatever you think of their policies and practices — was not well known outside of France. They are now INTERNATIONALLY known, as are their views. Instead of a “great deed” in murdering a room full of people with pens and paper, the Charlie Hebdo staff is now being mourned, on an international level, and their views are being embraced, instead of denounced as blasphemy. I remember the fuss, years ago, over the movie, The Last Temptation of Christ. Lots of people (Christians) were protesting it, calling it blasphemy, among other things. This gave the movie LOTS of free publicity, and a boost at the box office it might not otherwise have gotten. The same thing happened with Basic Instinct. It seems like this is something that evades folks who are easily offended for whatever reason — the more fuss is made, the more publicity that “offensive” thing gets, and the more non-easily-offended want to see it, wanting to know what is so “offensive” about it. I would like to challenge the al Qaeda, al Shabab, Boko Haram and Islamic State leaders to reread their holy scriptures. God does NOT need earthly defenders of His good name. Reread those scriptures and see what happens when God IS offended. He can DEFINITELY defend Himself against any and all who transgress against Him or offend Him. Not only does God not need defending, his prophet does not either. I have seen Muslims quoting the Quran about Mohammed praying for those who mocked him, and recommending the same. The people who committed these atrocities should not even be identified as Muslims, but as fundamentalists and radicals. All the Muslims I have known have been people of peace who are tired of being tarred by the radicals supposedly acting in their name. Thank you for taking a stand against this. The continual threatening of people who express their distaste at the current state of affairs within those who follow must stop. I know many people of the Islamic faith who do not support the atrocities committed by other followers of Islam. If the majority of the spokespeople for Islam came out and condemned the actions of, not just the perpetrators of, the attacks against free speech but also those who support the crimes occurring in the Middle East, then decency might come of it. The support of certain elements of the mainstream media (could I say the excusing of) when it comes to these sorts of attacks is to me very concerning. I wonder if these same media representatives would have excused the Nazi excesses to the same extent as they do trying to excuse Muslim extremism. I sometimes wonder if the extremists are using Jihad as an excuse to make up for other feelings of inadequacies in their own lives. Just wondering like. I’ve shared it in a different way: I printed this entry (in full color), and am showing it at Coffee Houses here in Chapel Hill, North Carolina. Thank you! It’s a pity the brothers died today. There will be idiot Muslims who consider them martyrs. However, I would have preferred to see them brought before a Sharia court and sentenced to a proper beheading for having insulted Islam by facilitating the broadcast and distribution of these tasteless cartoons, which would have lingered in obscurity and remained unknown but for their actions. Now billions have seen these cartoons. There is also a spike in anti-Islamic sentiment, which further damages the religion’s reputation, another reason these two would have to be condemned before any Sharia court. I admire your stand on the Paris terror murders. I would never buy a copy of that magazine and would not watch South Park. Both seem to me to be sophomoric. I also hated the painting, “P*ss Chr*st.” Some things are just beyond the pale for me but the idea of banning someone else’s thought processes is a frightening one. To start with, we are far better off knowing what the nuts are thinking than not knowing. Perhaps the way to dissuade these murderers is to do things that prevent them from achieving their goal of martyring themselves to reach paradise; e.g., bury them with pigs. I know, that would be disrespectful but certainly a punishment to fit the crime. A little while ago here in Sydney Australia, after a number of incidents where people have been King Hit and knocked to the ground, sometimes with fatal consequences, the term was renamed Coward Punch. And the media have successfully used the new name ever since. Overnight I read someone suggesting we start calling these terrorists cowards. The T word may give some a form of pride as obviously there are people who do these acts of horror, hopefully without being forced to. What an awesome idea. Start calling these people cowards. Pure and simple cowards, hurting/killing people who have no means of defending themselves. It is not terrorism, it is an act of cowardice. Andrew in NSW Australia brings up a very good point. The term “terrorist” has a perverse glory. So do the words “insurgent” and “extremist”. I propose, instead of calling them “cowards” as Andrew suggests, that we call them by their proper titles: “Gangsters” and “Thugs”. While I agree with most of what you wrote, I wonder how you reconcile your argument for freedom of speech while ridiculing USA Today for expressing their views? Not saying I agree with then, but don’t they have freedom of speech too? On the subject of Free Speech, please allow me to play the devil’s advocate for a moment: you have criticised USA Today for printing a statement from the radical muslim cleric supporting this massacre; and immediately afterwards have said that all ideas must see light of day to be discussed. It seems like a bit of a disconnect here. While I cannot claim to know USA Today’s actual motives for publishing that piece, I would say that it serves to show its audience that these were not renegades acting against their religion’s counsel, but in fact there are other religious leaders within the faith who condone and encourage such actions. Only by bringing such viewpoints to light can the true extent of the problem be understood and tackled. At the same time it allows people to see what a ridiculous viewpoint it is, which will hopefully lead to such radical extremists being further discredited in the eyes of the public and more importantly in the eyes of other (peaceful) muslims. The two Charlie Hebdo killers fled after their despicable act and almost escaped the police and hid out in a village north-east of Paris. They were on the 1st floor of a building and the employee was hidden in a pile of boxes on the second floor, he was in contact with the police — not really a hostage. The third terrorist says that the three of them planned for their actions to happen at the same time. He finished up in a Kacher supermarket where he initially killed 4 customers. The police planned rescue attacks at the some time for both situations. Bravo Randy, and thank you for speaking truth. When I think of this week’s events, I’m overwhelmed with our need to still find laughter, humor, satire, even in our darkest moments. Not to forget, but to process, and to become more…bigger than the tragedy. Yes Dad, I Am Charlie. This is fundamental difference between, say, Catholicism and Islam that I think most westerners / non-Muslims don’t understand. There is no central authority in Islam. There is no Pope. There is no One Supreme Cleric for the entire religion. Any Imam can say anything he wants. So no, he doesn’t speak for “all of them.” Nobody does. It’s a mess. Jews and Muslims: two peoples who agree that they will not eat pork. You’d think it would be possible to use that is a starting point of agreement and build from that. (end sarcasm). I’m not sure there’s any need to act respectfully toward murderers. If I urinate on Pol Pot’s grave, am I being disrespectful? Too bad. I agree with you. Yet I must ask why, in reporting “Separately, anti-terrorist forces stormed a grocery store in Paris where hostages were being held by a gunman who is reportedly linked to the brothers”, you omitted an adjective which was in every report of the incident that I have seen: “Kosher”, as in “a kosher grocery store”, whose customers were Jews shopping for groceries for their Shabbat (Sabbath) dinner. Also, have you seen the emails from Al-Jazeera regarding Charlie Hebdo coverage? “I Am Not Charlie Hebdo” —David Brooks, NY Times. Perhaps you should identify the fallacy for those who say USA Today was exercising “freedom of expression” when they carried the “Charlie should have known better” op-ed. You cannot say that it is allowable under “freedom of expression” to say it is okay to deny people their freedom of expression! Forms of official censorship exist to a great degree under Sharia law, to a limited degree in most European countries, and to a smaller degree in the US (when it apparently may have a potential for causing harm). I think an aversion to “insulting speech” is fine, but when you act against someone who insults you, you violate the ideal of free speech, not to mention the law. Re not using “terrorist”: Indeed. If you haven’t, read Dean Ing’s book, “Soft Targets”. Coincidentally, in that book, the name chosen by the media to make fun of the terrorists is “Charlies”! Indeed. Newspapers are increasingly not getting this: if they publish an article about sailing around the world, they wouldn’t consider publishing an “opposing view” from the Flat Earth Society, so why do they think that some radical cleric (or anti-vaccine loon, or Birther, or or or) deserves space? There’s some urge to be PC (not that this actually qualifies) that gets perverted and allows this. I agree with Gerry that “gangsters” and “thugs” are appropriate descriptions for the murderers here. Having said that, the perversion of words means that we have to choose especially carefully in cases like this, and not assume that others intend connotations that we disagree with. “Terrorist” is clearly a word meant to describe one who uses violence to try to achieve what should come through negotiation; those who intended to glorify them would in the past have called them “revolutionaries” or “freedom fighters”. “Insurgent” is a particularly good example of an unhelpful shift in implication. Prior to the invasion of Iraq, I had seen that word exactly once outside the pages of the Bible. When I saw its modern use, I inferred that the word had been chosen to refer to unlawful combatants whilst avoiding “revolutionary” or “rebel” — terms with positive connotations in American history. However, within a few years, the term was being deprecated by those in power in favour of complicated circumlocutions, as if “insurgency” legitimised those fighting and murdering. If denouncing this attack as “cowardly” was a new idea, I would agree with Andrew about encouraging it, as it’s accurate on this occasion. However, it is not at all new. It has been for years a term reflexively used about any terrorist attack, with the result that it distorts discussion of how to respond. People who murder for political/religious reasons don’t do so because they’re sure they will get away with it, they quite often do it for infamy or because they think their cause is more important than themselves. Calling them all cowards encourages people to think that simply catching them will prevent others from imitating them. This is most obviously wrong with suicide bombers. People who are willing to kill themselves in order to kill others aren’t cowards. They’re abhorrently evil and possibly insane, but they’re brave. More pertinent to this particular atrocity is the flipside of David’s comment: there is a frightening possibility (as is suggested here, for example), the murderers actually don’t have the slightest intention of deterring the dissemination of anti-muslim cartoons. By targeting Charlie Hebdo, they bring its deliberately provocative cartoons to the attention of moderate muslims, who then feel alienated by the cartoons and by the public reaction. More importantly, they may actually want to increase anti-islamic sentiment, as this would give muslims more reason to join the ranks of extremist organisations. If that happens, then the terrorists really do win. There is a subtlety of French language that English-speaking people would not see. As written, “Je Suis Charlie” actually has two meanings. The verb “suis” is a conjugation of two different verbs: “être”, to be; and “suivre”, to follow. So, “Je Suis Charlie” can be translated in two different ways: “I Am Charlie” and “I Follow Charlie”. In America “Freedom of Religion” part of the 1st amendment has been rapidly becoming “Freedom from Religion” and the “Freedom of Speech” part is changing, in some deluded concept of tolerance, to “Freedom from Discomfort, Insult and Offense”. This has lead to the current hysterical editorials and columns blaming the victims not the perpetrators. They probably don’t recognize the hypocrisy demonstrated by doing so. But in the US today, one can still say and advertise “Jesus Saves” if willing to experience scorn and Freedom of Speech still allows me to repeat the true but sophomoric statement that “Christmas is the celebration of an event wherein a 15 year old woman gave birth to a child that was not her husband’s”. Retaliation for this true statement would not be editorialized in the same vein as retaliation for a true statement about anything or anyone connected to Islam. Some religions are more equal than others. Meanwhile, our PC all-loving, tolerant, peaceful Fearless Leaders and Media Moguls demean and belittle the followers of the Bible and the Torah while they (a) scorn any hint of suspicion or actual questioning of terrorists that cloak their vile mission with a veneer of religion and (b) will not seriously consider the possibility, much less the ramifications, of a terrorist population eventually overwhelming an election in a small town. So far,the Constitution still lives and it’s still OK to rely on the 3rd amendment — but maybe not after the rest of the first ten totally crumble. I was appalled that after the shooting at Charlie Hebdo so many news sources did not support complete freedom of speech. They were all for it, as long as no one was offended, not seeming to understand that the right is only important when someone is saying something that DOES offend people. You obviously get that, so supporting This is True is a small thing i can do for free speech. It really needs to be said that they didn’t just storm a “grocery store.” They targeted a Kosher market where Jews would be doing their weekly pre-Shabbat shopping. The hostages who were killed were all Jews, and Paris police confirmed that the hostages were murdered by the terrorists before the shootout with police. I guess the controversial Bill Maher clips are relevant again. But I’d also like to point out the work of Maajid Nawaz and the Quilliam foundation. Here’s a short clip of Nawaz. His book “Radical” is a very interesting read. By giving in to the fear of ‘offending’ ANYONE, you will legitimize their possibly snotty or violent reaction. By stifling one’s right to expression, in order not to offend, one places that power into the hands of the offendees. Personally, I don’t want a bunch of brainwashed, too dumb to think on their own, extremists from Any religion, telling me what I can say, think or do. Mentioning “freedom of speech’ in this context shows lack of understanding for phenomena of growing Islam militant radicalism. We have to understand that this really is “Death to infidels”, global war to eradicate everything and everybody else. This terrorism has a simple strategy: drive the wedge between Islamic and non-Islamic world and polarize “undecided” in both. Islamophobic reaction to meaningless bloodsheds around the world is to convince Islamic population that Islam is under attack and recruit more and more militants for the Jihad and slowly bleed our strength by spending resources to improve our security, at the same time. Attacking targets like Charlie Hebdo for insulting the prophet is to justify their war to Muslims who don’t necessary agree with “Death to infidels” philosophy and who believe that we can coexist. They don’t hate (only) freedom of speech, they hate everything we are for being different and giving more than one option on how to live. They don’t care for human life, they don’t see human progress as progress, they don’t respect our values — they don’t care how many people on either side have to die on their march to their holy goal. Our fight is not fight for freedom of speech; we fight for right to exist, the way we are. I am Charlie too. If you had a bumper sticker or anything that said “I am Charlie: This is True” I would buy it even though I am broke. This is worth fighting for at any cost…I AM CHARLIE. Before reading your post I had already made a connection between This Is True and Charlie Hebdo. Both address a wide variety of issues without regard to what sacred cows may be impacted. My long term subscription to True demonstrates my appreciation. I am also a strong believer in freedom of expression; I even oppose “hate speech” laws because I don’t believe in penalizing someone for what they think. I also oppose the appeal to violence, from property damage to murder, to settle ideological differences. But I also took note of a difference, too, responsibility. True takes on a lot of issues. I often agree with the positions taken but not always. But I still listen. I have never seen True as a slammer of a particular group except for those members who take issues to the extreme, intending to interfere with the rights of others. As I researched Charlie, I didn’t find that level of responsibility. In particular, I saw a continuing anti-Islam campaign. This was not directed at Islamic extremists but at Islam in general. Everyone is entitled to his or her own opinion, but at the same time there is an ethical duty to express it responsibly. Charlie did not do this. The anti-Islamic campaign could be expected to draw a violent response, witness the earlier fire bombing of the facility. These publishers/cartoonists were not simply risking their own lives. Note the two police officers killed in the initial attack who had nothing to do with publishing the magazine. Nothing justifies the murders that took place in France last week, but they might have been avoided. Randy, please continue to do it your way. You give us smiles (and the occasional groan and tear). True is an extraordinary resource that has touched many lives, including my own. Others here have already expressed my thoughts more eloquently than I could, so all I will say is I AM CHARLIE. Thank you for adding yourself to the list of those who are Charlie. I am left wondering why you used the phrase “Extremist terrorists,” in your excellent article. Is there any other kind of terrorist other than an extremist one? You are not “getting to the bottom of” anything unless you also discuss the historic precedence and Islamic religious teachings that endorse the killing of those who insult Mohammed as well as Islamic beheadings in general. ʻAṣm&amacr;ʼ bint Marw&amacr;n was ordered to be killed by Mohammed in January of 624 in part because she had ridiculed him through poetry. Abu ‘Afak was ordered by be killed by Mohammed in February of 624 because he had ridiculed Mohammed in poetry. Al Nadr ibn al-Harith was ordered by Mohammed to be killed in March of 624 because he had mocked Mohammed. Uqba bin Abu Muayt was ordered by Mohammed to be killed in 624 because he had mocked Mohammed. Mohammed ordered Abu Rafi’ ibn Abi Al-Huqaiq to be killed in December of 624 because he had mocked Mohammed. And the list just goes on and on and on. From the 600 to 800 Qurayza Jews that Mohammed ordered to be beheaded in a single mass murder incident, to his order to “fight and slay the pagans wherever you find them, and seize them, beleaguer them, and lie in wait for them in every stratagem”, Islam has always ordered violence and until people are educated with those historic facts, there it is guaranteed that there will be more and more murders in the name of Islam. I’ve long thought that the extremists act the way they do because their faith is weak. I think it’s pathetic that they must shout “God is great!” whenever they commit another atrocity. Who are they trying to convince? Je suis Charlie! Vive La France! There’s the Right to Free Speech, and there’s the Right to Not Be Offended. I don’t think I missed it among all the comments, but perhaps it should be made clear thet Charlie Hebdo insults and ridicules EVERYONE! Any religion, politician etc. etc. etc…. Islam is a long way from being singled out. Only by themselves by being the only (bar one extremist right-wing group) ones to resort to violence to object. Interesting debate. I have no problem with extremists being given a soapbox — here in the UK we have Speaker’s Corner (in fact several of them) where people can do just that — get up on a soapbox and say ANYTHING. This of course exposes them to ridicule, which is what many of them deserve. If we encouraged more of the extremist nutters to do this, the world would be a less fearful place. On another note, there is a tendency to regard the Charlie Hebdo attack as being about organised Muslim terrorism, simply because they shouted “Allah is great!” Yet Charlie Hebdo had a history of attacking ALL religions. I don’t think I would have regarded it as a Christian attack if they had shouted “Hurrah for the Archbishop of Canterbury!” or a Jewish attack if they had shouted “Three cheers for the Chief Rabbi!” So I doubt if many Muslims would identify with it either. I see a number of folks here saying that Randy’s criticism of USAToday is somehow infringing upon THEIR right to Freedom of Speech. It’s not. The RIGHT to say anything (except “FIRE” in a crowded movie theater, etc) does not guarantee them freedom from criticism, or debate. “I may not agree with what you say, but I will defend to the death your right to say it.” (variously attributed to Voltaire and Patrick Henry) does NOT mean I will not criticize you or debate you on what you said, nor does it mean I’ll defend WHAT YOU SAID. It means I acknowledge your right to say this thing I disagree with, and will not seek to see you silenced. I am, however, very likely to vocally express my disagreement, and I may do so passionately. I will not -KILL- you over it. No one deserves to DIE for talking, writing, or otherwise sharing their opinion — no matter how fantastic or abhorrent YOU find their opinion. I think Carl from Buffalo mis-categorizes Bill Donahue’s position by saying that he “sympathizes” with the perpetrators of the Charlie Hebdo murders. Donahue clearly states that killing people is not an appropriate response to being offended. What he does say is that he understands how Muslims would be offended by some of Charlie Hebdo’s cartoons. Consider what the opposite position would be: “I condemn your actions, therefore I am unable to understand why you did them.” Understanding is not the same as agreeing. Donahue points out that the actions of Charb (Charlie Hebdo’s publisher) are what caused him to be targeted, and if he had not chosen to offend Muslims he probably would not have been. Who can argue with that? To claim that this is “blaming the victim” makes as much sense as claiming that pointing out that walking alone down a dark alley increases your chance of being mugged amounts to blaming the victim. Saying that the victim could have acted otherwise does not mean that you are excusing the attacker. I have read every word of every post and once again I am amazed at the wisdom found in Randy’s readership. Carry on! And yes, I am Charlie! The Quran teaches Muslims to kill critics of Muhammed and Islam. They are following Muslim law (Sharia) and have no regard for western rights and law. You may reject that thinking but that will not stop the killing. Let me begin by stating that I have no support, and no respect for murders. Killing is not the appropriate response to any published content. I do have a question about Freedom of the Press. We all accept that basic Civic Responsibility requires that we put limits on Freedom of Speech. (“Fire” in a theatre.) Are there not similar limits on Freedom of the Press? Criticizing anything to expose its fallacies is, to me, journalism and therefore to be protected. Mocking that same thing, with no context or content, solely to produce a reaction, sell more papers, get more clicks, isn’t journalism. It’s rabble rousing and economic self interest. Why should it be protected by Freedom of the Press? I am NOT “Charlie,” Charlie is my brother. I’m Guy, and I stand up for what “Charlie Hebdo” does. Lampoon, poke fun at, criticise and make others uncomfortable. So did (does?) MAD Magazine and “The Onion.” So, vive la Charlie Hebdo, and all others that try to bring humor into our dreary lives. On another note, in the 1700’s, a group of people were unhappy with the way their leader treated them, and decided to go their separate way. The “leader” and his counsels called them “terrorists.” They called themselves The United States of America. While I do not agree with the jihad practiced against the non-Moslem world, the people who are engaged in its warfare see themselves as revolutionaries and freedom fighters. Never, ever forget that, because to do so reduces them to cartoonish figures in you mind. And to reduce them to that level is dangerous to all of us. I am not Charlie. I am John. I have watched as the memorials and tributes have been given for these 17 men and women. While I support press freedom and deplore these tragic murders, I cannot say, “I am Charlie” and commiserate with these families. The cartoons themselves were little more than sophomoric caricatures drawn more for amusement of their audience and deepened divides already made vast by over a decade of perhaps warranted suspicion and ostracism of Muslims in western society since September 11, 2001. The Charlie Hebdo and victims in the kosher supermarket are not heroes, and save two or perhaps a handful (reports are still murky), did nothing heroic in my mind. They exercised the same freedoms you and I have and there is nothing innately heroic about that. They were cut down because small men could not comprehend others wanting a life outside their blinder driven view of the world. Tragic. Pitiful. But I will not cheapen their death or memories to say “I am Charlie”. To truly support free speech in particular and freedom in general, do not do it with blasé phrases such as “I am Charlie”, “I am Newtown”, or “I am Boston.” Do not join follow blindly any such lemming-like march. Be the one to stop in the middle of the march and ask, “Just where the hell are we going? Do I truly want to go there?” Question the mob mentality. History is rife with the examples of following the crowd leading good people down the paths to supporting atrocities upon their innocent fellow men and women: Nazism, Stalinism, McCarthyism, Crusades, Gerald Sandusky, Birmingham, Little Rock Central, Norwood High School, even the Crucifixion of Jesus. Reflexively STOP. THINK. And only then, act. Don’t just join the crowd. Maybe *you* will be the only one to see that our dumb asses are about to go off the cliff and maybe your voice is needed to stop us. You can practice this in our cloistered electronic social media society by subscribing to or giving ear to voices you perhaps disagree with but who generally do provide facts you can research. I find I get a more balanced view of what is happening in this world by looking at both the liberal and conservative news organizations and what they think is important for any particular story and when I see both sides saying the same thing, I diligently search out dissenting voices. If there is not two or more sides to the story, usually no one is really looking very hard. And this is when we as a society get blindsided. I see so many of my friends who are ardently on one side or the other of the political spectrum and they actively cut themselves off from any dissenting views. They unfriend ardent supporters from the other side on Facebook and they quit interacting socially with them. After they do this, their worldview narrows considerably and they find themselves *shocked* when their candidate doesn’t win or some other political setback happens to their side of the spectrum. It’s one thing when it’s just political miscalculations, but I have seen it also blind people to oncoming financial crisis’s that have the potential to affect their families well beings for years or decades. Don’t blind yourself to realities. Instead open yourself up to at least considering the facts those opposing your view lay out. We all have differing backgrounds, experiences, talents and skills. In this complex technological society there is very rarely a “right” answer to any particular tragedy, crisis, or other event. And one final thing you can do in support of freedom both of speech and in general is to support smaller non-mainstream sources of information like this one or your locally owned small newspaper, an internet blog or any other small information provider that is fighting for survival in this global mega media information society. Support them as much as you can afford, else these independent sources information can disappear very easily. In closing, I am not Charlie, but as a man with a sometimes sophomoric sense of humor about some things, I do mourn the fact that in this global society we are building that jokes, words and cartoons can lead to deadly conflicts between cloistered subsets of society and that’s just inhuman. That one would judge the worth of a human life based on the words from their mouth for just a few seconds or minutes out of that long life, whether it would be for the lesser as in the case of the murders or the greater in the case of the long lines of memorial goers who knew not the individuals so brutally cut down. The worth of a human life if it *could* be quantified should be more about the actions taken and not these cheap words. If I have understood the news reports here in the UK (and it is always possible I have become distracted at a critical moment, in which case perhaps someone would be so kind as to correct my mis-apprehension), several of the customers in the Kosher supermarket were protected by a Muslim employee of the supermarket, who hid them in the ‘cold store’. I find the most inspiring comment is this string to be Randy’s encouragement to seek multiple sources of what I like to call “information” — quotation marks added purposefully — to inform your thinking. Testing and validating this “information” is in my humble and occasionally accurate opinion the primary skill we should be teaching every generation. Ignoring and condemning all viewpoints opposed to our own, quite possibly misinformed and therefore biased opinions, qualifies us for little beyond being extremists of ANY flavor — or perhaps an elected government official. Paris: 1.7 million march to mourn and support Charlie Hebdo’s right to free speech. Pre-murders circulation of Charlie Hebdo: about 60,000. 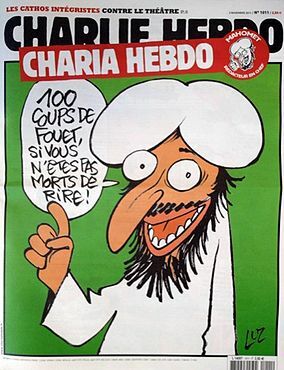 Post-murders circulation of Charlie Hebdo: 3 million. A most successful operation I would say — NOT. A classic case of how “the operation was a success but the patient died”. By the way, what does a Kosher supermarket have to do with Charlie Hebdo? Is there some connection of which I am unaware? Were they just feeling like killing a few Jews while they were out and about, as they were unlikely to be able to do it later on? Doesn’t seem to have anything to do with “protecting the honor of the Prophet”. On January 9, Bob from Canada pointed out the irony of your assertion that you believe all ideas should be aired freely, while apparently questioning USA Today’s decision to do just that. In your reply, you agreed that they have the right to publish the piece, but went on to say that they do not have the freedom to force people to agree with the published piece. Its not clear to me that you, me, or anyone else was forced to agree with anything; when did that happen, exactly? Also, you state that ideas should be discussed rationally, yet many of your replies to the comments on this page with which you appear to disagree come off as hostile and abrasive rather than as the rational discourse you claim to embrace. New issue print run: 7 million (currently) in 5 languages including Arabic. Over 100 times their normal output! Shooting the messenger is rarely a good idea, but in this case it has proved disastrous. News in from Nigeria is bad too. They have managed to kill 5 people, including one found in a burned church, one of several burned down. What do churches and businesses (also burned and looted) have to do with Charlie Hebdo? Just because they’re not Muslim? What part of “Liberte, Fraternite, Solidarite ” don’t the Muslims in France understand? They moved there, it’s the foundation of the French Republic. It’s “Liberté, Egalité, Fraternité”, by the way. There are those that go to a foreign country for work reasons and join in the local culture (as I have done), others who move and look for their own culture. The third group is there to try to modify local culture.